24 MAMMALS IN 24 HOURS: Mammalthon 2 is coming April 19! Last December, 36 beautiful, generous, animal-loving art aficionados participated in the first Daily Mammal 24-Hour Mammal Marathon. I stayed up for 24 hours straight and drew a mammal an hour (almost). People who donated to Defenders of Wildlife got to request a mammal, see it appear during the 24-hour mammalthon, and then receive the original drawing in the mail. It was unbelievably fun, and we raised more than $800 for Defenders. It’s time for Mammalthon 2! This time, the contributions will be going to The Wildlife Center, a wonderful wildlife rehabilitation hospital in northern New Mexico. Spring means baby season and hundreds of injured and orphaned baby animals that need a place to recuperate and some help getting back into the wild. Your participation in Mammalthon 2 will help make su re these babies, and all the other animals The Wildlife Center rehabilitates, get the care they need. Here’s what you do. Click the donate button you see below or in the right-side navigation bar. When prompted, request any mammal—any mammal in the whole world, even if I’ve already drawn it (although I’ll really love you if I haven’t). If you donate at least $35, you’ll get to help The Wildlife Center, see your mammal appear during the mammalthon on April 19, and then receive the original drawing in the mail! If you donate at least $50, that original drawing will come matted and ready to frame. The first 24 requests will be filled during the actual mammalthon (I hope I hope!). Like last time, I’ll wo rk hard to draw any additional requests (back orders) in the order they were made as quickly as I can. 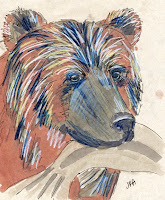 The mammalthon is a fun way to support art and animals at the same time. 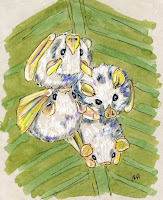 Mammalthon drawings make great gifts, too! Even if you can’t donate this time, please stop by on April 19th. The comments and support are what keep me going during the long long hours of drawing, and they mean so much! I have to echo Jennifer’s sentiments — even if you choose not to donate (and why would you do that?) you should still log in often on April 19 and 20. At the first Mammalthon, in addition to the hourly mammals, I posted updates every couple of hours on Jennifer’s progress and energy, including some photos and such. Jennifer received, and replied to, lots of encouraging comments, and I tell you they made a tremendous difference for her. She’d get back to work and keep saying how so-and-so was really sweet, or how great it was to see a particular person was checking in. The Mammalthon is a fun event. Be a part of it and help Jennifer raise money for a great cause, even if you can’t give any yourself.